New Roku owners can be overwhelmed when browsing the Roku Channel store with thousands of channels. Many ask "what are the best Roku channels?" so they can start with those. Although selecting the "best" is a subjective endeavor, a good place to start with the most-watched Roku channels. 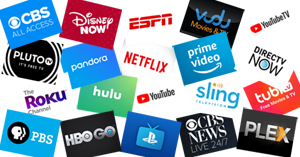 The channels listed below are 20 of those that have consistently been at or near the top of Roku's list of the 75 Most Watched channels. Movies, shows, award-winning Prime Originals, premium channels, sports and more. Watch your favorite cable channels without a cable subscription. ESPN, AMC, Food Network, A&E, HISTORY, TNT, HGTV, Disney Channel, CNN, and much more. Features CBSN, the 24/7 digital streaming news network from CBS News, as well as on demand video from CBS's awarding winning news programs. This article is updated from time to time as Roku's list of most watched channels changes. Therefore, you may see older comments below that don't pertain to the current list.